As local doctor, Dr. Robert Heyl observed the trauma abused children endured, not only from the abuse, but from their experiences of having to repeat their story over and over to multiple agencies in various locations. He had a vision of a neutral, safe, child-centered structure designed to nurture the abused child, and he discovered the child advocacy center model founded in Huntsville, Alabama. 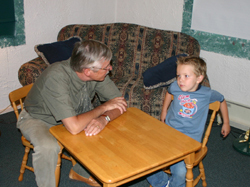 In partnership with the Montezuma County Child Protection Team, the Montelores Mental Health Association, area businesses and concerned citizens the Four Corners Child Advocacy Center was established in 1993. In 1995, our Center became a nationally accredited Child Advocacy Center.